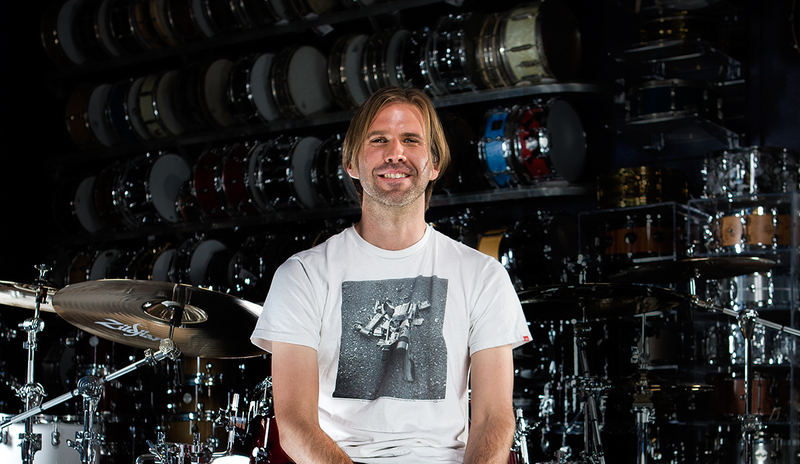 To follow in his family’s footsteps, Wackerman says it needed to be his choice to make, and he needed to figure some things out on his own, starting with the kit he wanted to play, and eventually, the style of music he’d focus on. “We had multiple drum kits in the house, and I remember tying a balloon to one of the cymbal stands. I think I did that just to pee on my territory. Then, when I found the style of music I wanted to pursue, I took it personally. I felt like I owned it. I think it’s important for parents to not force anything too hard on kids. It’s a matter of discovery for them,” Wackerman says. As the youngest of four boys, Wackerman is separated from the oldest by two decades. By the time Wackerman turned five, he saw his older brother Chad, 17 years his senior, earn a spot playing with Frank Zappa. For Brooks, born in Orange County, Calif., in the late 1970s, and having already subscribed to the spirit of finding his own way, it was only natural that he gravitated toward punk. “I study all different styles: jazz, reggae, rock. But when I heard The Vandals for the first time, that’s when I knew I wanted to go more into the punk direction. Then seeing The Vandals with Josh Freese, I remember just being blown away by how he is as a player. So he actually was one of the reasons I started practicing a lot,” Wackerman says. Wackerman’s session successes include The Vandals, Korn, Infectious Grooves, The Innocent, and, since 2001, Bad Religion. Some of his latest work also includes recording with experimental industrial rock band Fear and the Nervous System, a tour with Avril Lavigne, two with Tenacious D, plus an Australian tour with Blink-182. 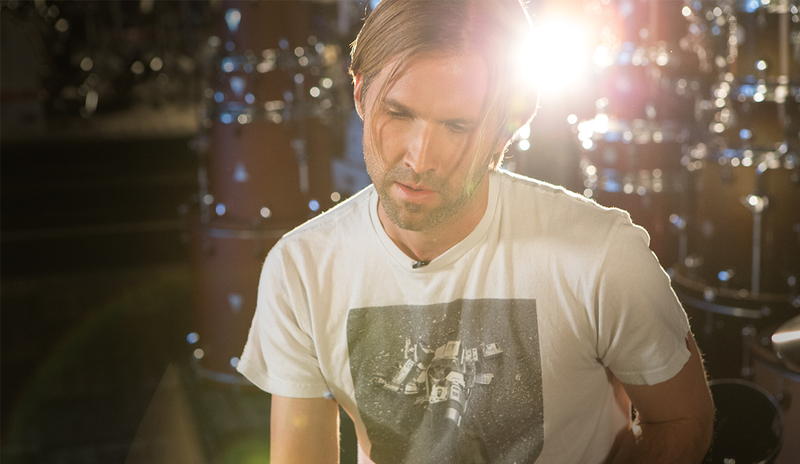 To cover the vast array of sounds he needs to keep moving forward with his career, Wackerman says DW offers him the ability to find the right sound for every musical setting. One of Wackerman’s favorite kits is the newly introduced Design Series which features 100% American maple, 8-ply HVLT shells that don’t have reinforcement hoops, which opens up their sound. HVLT is DW’s way of noting the direction of the grain of the wood for the drum’s plies: horizontal on the outside, and vertical on the inside. “I’m the happiest I’ve been in years in terms of both my drums and cymbals. 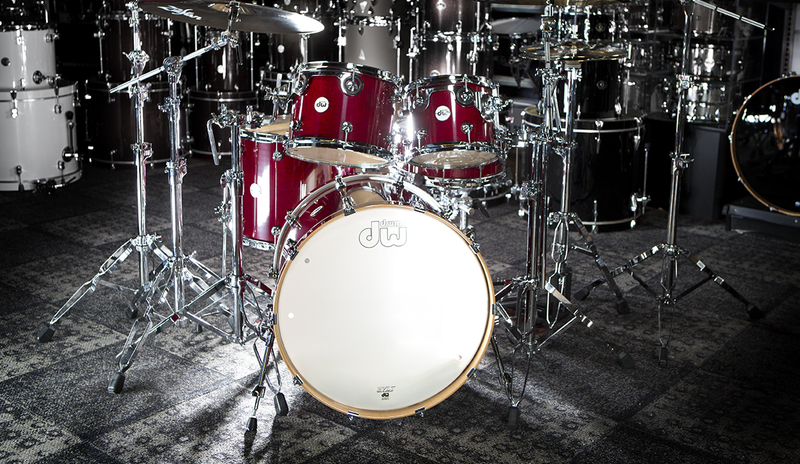 With HVLT shells, you have the best of both worlds with a big low end and some nice highs. The kit that I was playing today is a cherry, and I have a white pearl Design Series kit at home. They all have turret lugs, which are smaller than the classic DW lug, so the finish comes out more. And the snare has a MAG throw-off which is really easy to use. It’s a great-sounding kit. I wish I had this option growing up. I think a lot of kids and bigger kids will enjoy it,” Wackerman says. 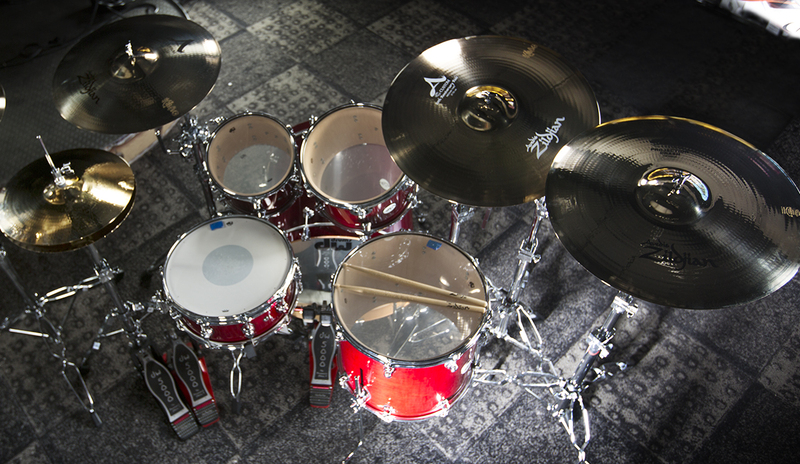 To complement his DW Design Series kit, Wackerman employs a range of Zildjian cymbals, including the K Series cymbals and a unique hi-hat setup. “My hi-hats are 18” and they’re not actually hi-hats. The top is a Constantinople 18” crash and the bottom is an 18” Breakbeat ride,” says Wackerman. “They look very masculine but they have a sweet spot. They always have a sweet spot. To my left is an 18” FX A Custom, then a 19” FX A Custom, and a 23” A Custom ride. In between are all K’s: an 18” session crash, and a 22” light ride. Following a grueling summer touring season, Wackerman says his biggest gig for the next couple months will be hanging out with his twin boys. “Just from their surroundings, I think it’s inevitable that they’ll be doing something in the arts. They love painting, and they even love jumping up on the kit. My dad’s teaching them. I was gone this whole summer, but my dad has been teaching them once a week, so they’re doing ‘mama-dada-mama-dada-mama-dada’ on the snare,” Wackerman says. This fall, Wackerman will be playing three one-off shows with Bad Religion in Chicago, Denver and at the Verizon Amphitheater in Irvine, Calif.
“It’s still Irvine Meadows to me,” Wackerman says. “I’ll also be playing with Tenacious D. In October, Jack [Black] is putting on a comedy festival called Festival Supreme in Santa Monica. “In addition to that, I think we might be doing some more jazz shows with Tenacious D. We put out a jazz record last year of one song that’s 15 minutes long, so we just extend that song into an hour where we don’t stop playing the entire set. So if anyone has a tolerance for that I recommend coming out,” Wackerman laughs.